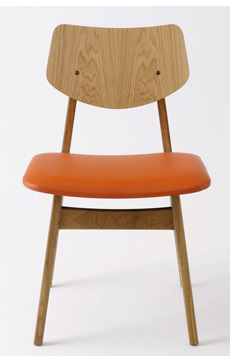 At ninety-four years of age the Danish-born American designer Jens Risom has collaborated with Rocket and Benchmark, who have jointly secured the European rights to reissue his 1950s and 1960s furniture designs. This first collection of nine pieces has been creatively directed by Jonathan Stephenson of Rocket and made by Sean Sutcliffe and Terence Conran’s Benchmark Furniture company in their Dorset and Berkshire workshops – with the close involvement of Risom himself. These pieces are available in oak and walnut versions and are upholstered in a variety of Kvadrat fabrics and Elmo leathers.